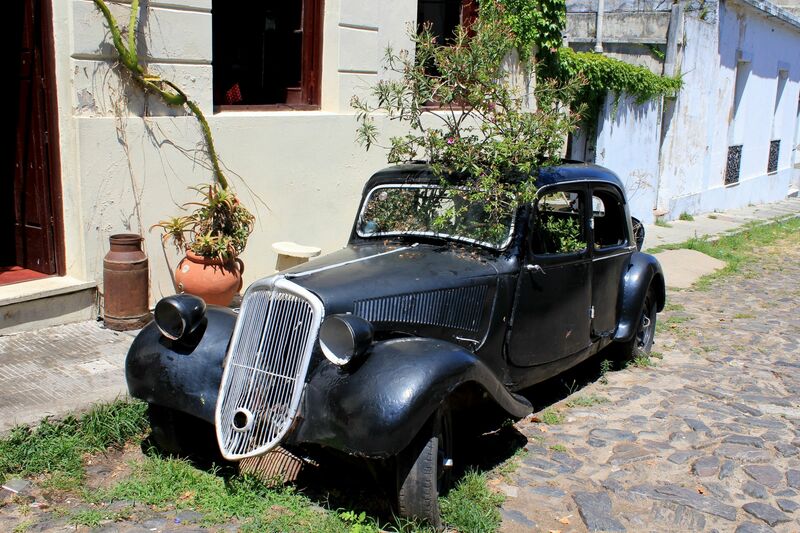 Colonia Antigua Tour presents Colonias’ Barrio Historico declared a UNESCO World Heritage Site, museums, antique cars as well as points of touristic interest in the historical district. Most of Colonia’s museums are located in old, historical homes. This creates a truly rustic ambiance “tinted by patinas” of old times; however, it also sets strict limits on the size of expositions. 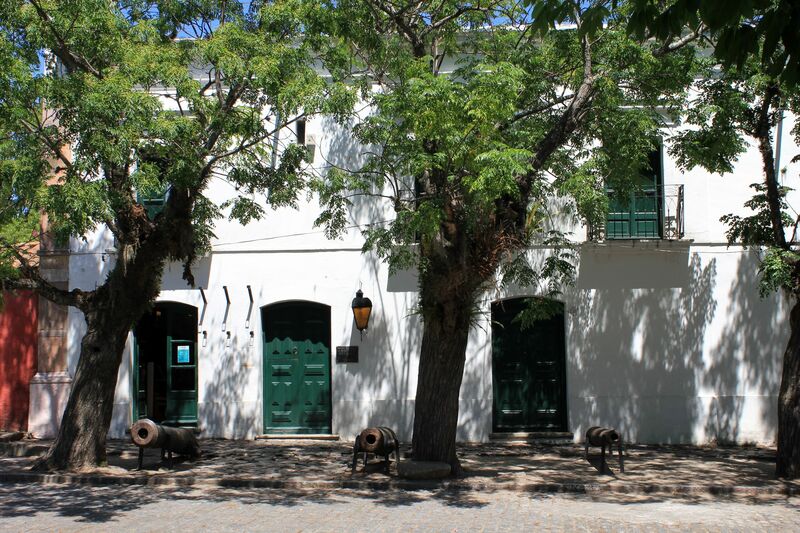 The museum is located in one of Colonia’s oldest Portuguese houses, dating from the early 18th century (1717-1722). Called Casa de Rios (Rivers’ House), it houses collections from Portugal’s colonial times. Here, you will find original furniture (and some replicas), mostly donated by the government of Portugal; ceramics, jewelry, weapons, war banners, and black-and-gold uniforms of the Dragoons Regiment from the 1770s. You will also see the original shield from the Puerta de Campo and old maps from Portuguese naval expeditions. Keep in mind that since the time of Henry the Navigator (15th century), Portugal was one of uncontested rulers of the high seas. The building itself, with its thick 60 to 90 cm (2 to 3 feet) stone walls and tiled floors, is itself an object of great historical value. Sala de los Reyes (the Royal Room), with original tiles representing Portuguese monarchs or Sala de los Gobernadores (the Hall of Governors), well summarize the epoch. The Colonia’s Municipal Museum (at today’s Calle Comercio) was established in 1951, thanks to the tireless efforts of its founder and later honorary director, Dr. Bautista Rebuffo. As the first museum in Colonia, it opened a new era for this “long-forgotten” city. It is located in a Portuguese house dating from 1793 that had initially belonged to Governor Don Francisco Albin. For many years, the building was known as Casa de los Secretarios (Civil Authorities of the City). In 1835, during the Spanish control of Colonia, the house was modernized and enlarged by adding a second floor. It then served as Admiral William Brown’s headquarters (Brown is recognized as the Father of the Argentinean Navy). After that, the house was known as Casa del Almirante Brown. Today, the museum bearing the name of Dr. Bautista Rebuffo holds several expositions, including local archeological relics, artifacts from the golden times of Real de San Carlos’ Bullring and Casino Hotel, original Spanish and Portuguese furniture, musical instruments, agricultural tools used by settlers, and numerous documents that reflect the social life in Colonia Antigua generations ago. The second floor includes two expositions: a selection of military weaponry and documents from the Great War (Guerra Grande, 1843-52), donated by the De la Quintana family; and a selection dedicated to paleontology. Numerous body and trace fossils revealing forms of prehistoric life were collected by two local pioneers of paleontology, Augusto Teisseire and Butista Rebuffo, and were generously donated to the museum. Ironically, the Spanish Museum (at the intersection of today’s Calles España and San José) occupies a Portuguese house dating from 1720. During its colorful history, the house once belonged to a Spanish businessman named Don Juan de Aguila. During the 19th century, the residence was used by Bartolomé Mitre, a statesman, military figure, man of literature and President of Argentina (quite a lot of accomplishments for just one man)! Since then, the house became known as Casa de Bartolomé Mitre, which made it easier to establish a Spanish Museum in a home of Portuguese origin. Actually, the Spanish presence is quite visible throughout the house. For example, the beautiful ceramic floors are from Castilla, Zamora and Galicia, and the tiles are decorated with the shields of the Spanish Provinces. The museum opened in August 1976 after an extensive renovation, bringing the smallest details to life from its rich, aristocratic past. Original thick stone walls, internal staircases, doors and hardwood mezzanines date back to the beginning of the 18th century. The museum includes a painting of the Viceroy de Rio de la Plata, Pedro de Cevallos; a flag of the Spanish Regiment from Montevideo; military uniforms of Infantry Regiments from Cordoba; and pottery, clothing, maps, coin collections, and original historical documents, all accompanied with detailed descriptions and stories from Colonia’s past. Shortly after entering the old city of Colonia, you will realize that tiles played a significant part of its colonial past. Street names, house numbers and their owners’ names, and even maps make use of tiles. Given these facts, Colonia’s Tile Museum seems to be in the right place. The museum found home in an almost three hundred year-old Portuguese house. It is located between Paseo de San Gabriel and Calle Missiones de los Tapes. 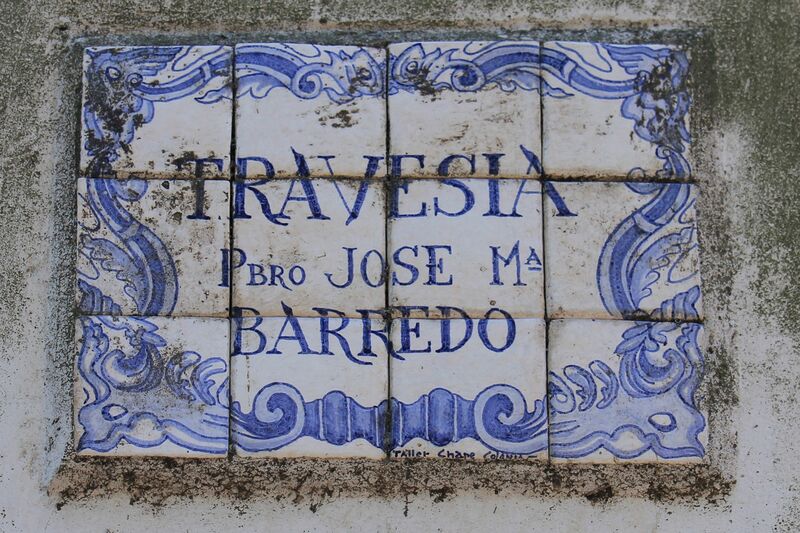 Ceramic tiles are abundantly used throughout the Colonia Antigua - here displays the street name. It holds an impressive private collection of old tiles from France, Spain, Portugal and Uruguay from the 18th century. The collection belonged to Jorge Paéz Vilaró, a famous Uruguayan painter, art critic and collector, founder of art galleries, and a promoter of South American artists. It may be interesting to note that the Spanish name “Azulejo” comes from an Arabic word, “az-zulaiy” (meaning “brick”), which reflects the long presence of the Moorish people on the Iberian Peninsula. The tiles as well as the art of surface decoration on the tiles originated in an ancient Mesopotamia and subsequently spread throughout the world. The Regional Historical Archive is located in an elegant 18th century Portuguese mansion once called “Casa de Palacios.” The house retained its initial form with original walls, ceiling beams and tiles. Today, it holds an impressive collection of historic documents about the city of Colonia and surrounding regions, as well as maps. Some of these were brought back from abroad (Spain, Portugal and other neighboring South-American countries). The “Sala de Luctura” (meaning “Library”) is itself a “museum” inside the Museum, and holds 19th century records from Colonia’s Police Department. 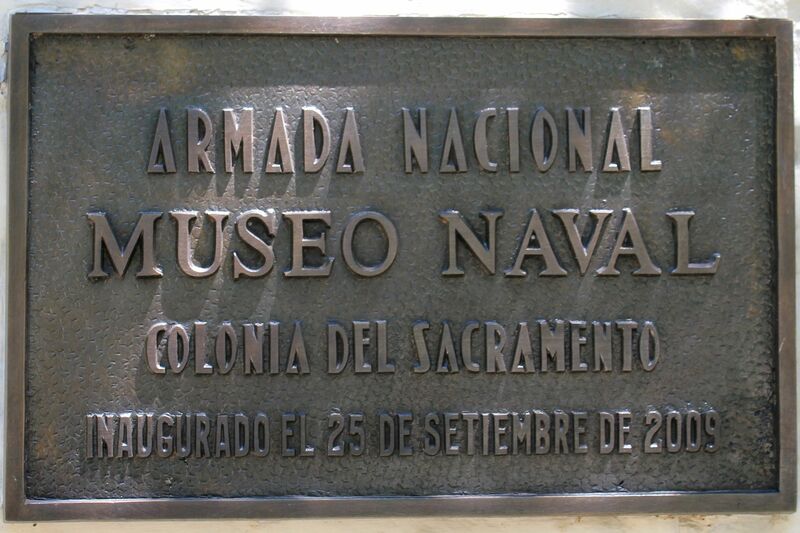 This museum, which opened in 1998, is one of the newest additions to Colonia Antigua. It holds a private collection donated by Roberto Banchero. The exhibition includes objects that once belonged to local indigenous tribes of the Churruas Indians, such as weaponry and “house tools” made from bones, stones and clay, bows, arrows and arrowheads and ceramics…. Sadly, if I remember correctly, the last pure-blood Uruguayan Indians died in the 1930s (the tragic event is commemorated by a monument to indigenous Indians located in Montevideo). But maybe this is one more reason to visit the Museo Indigeno – to pay homage to those brave people made extinct by our so-called “morally superior” Western civilization…. Inscription plaque on the Naval Museum's front wall. Naval Museum was opened very recently (in 2009) so you will not find much information about it. That is why I decided to "spread news" about this "newcomer" to the Colonia Antigua by presenting a gallery of pictures displaying some expositions. Exposition of naval instruments and weapons in Museo Naval. Part of the exposition in Naval Museum. - 3rd: old cannon recovered from the sea in front of the museum. Well, although you will see many of these beautiful "Dinosaurs" dotting streets of Colonia Antigua, they are not part of its remote colonial times. You will easily recognize them as something you are much more familiar with (in this case the first-half of the 20th century seems to be like yesterday :-). Other interesting architectural sites include Nacarello’s House (Casa de Nacarello), a recently restored Portuguese house dating from the 1790s, and the ruins of Casa del Virrey (Viceroy’s House). While the original objects recovered from Casa del Virrey display its magnificent structure, the name is misleading (if not confusing), because Colonia was never a seat of Viceroy. You may also have a look at the “traces” of Casa de los Gobernadores, located on the Plaza Manuel Lobo, or learn more about its past. The building dates from the mid-18th century, when it was the most important administration center in Colonia. According to historical records, Casa de los Gobernadores was elaborately furnished: portals and windows were framed by carved stone, only the finest wood was used in the interior, and other luxury ornamentations adorned the building. This richness certainly emphasizes the importance of Colonia as a trade (and smuggling) center as well as a military outpost. Unfortunately, it was also a regional hub for the trade of African slaves up the Uruguay and Parana Rivers to what is today Peru and Bolivia. The Casa de los Gobernadores was destroyed like many other important and valuable buildings of that time. After being badly damaged during frequent wars, its demise was sealed by the Spanish Viceroy of Rio de la Plata, Cevallos, who in 1776-77 sent almost all of its interior objects, decorations and construction materials to Buenos Aires. Today, we can only use our imagination to visualize the Casa de los Gobernadores as it was during its most glorious days. Left: Today, we can only use our imagination to visualize the Casa de los Gobernadores as it was during its most glorious days. On this amazing journey from the past to the present, you will find many cafes from which to choose to enjoy an afternoon coffee or glass of wine. You may also stop for longer to enjoy an excellent food in local restaurants. There are also many artisan shops and boutiques, where you may come across interesting, fashionable items at reasonable prices. On the next page we will stop at some restaurants and boutiques. After well deserved “refreshments” we will continue our tour moving outside of the Barrio Historico to an old military outpost of Real de San Carlos. It will be interesting to see and read the story about the oldest church in Uruguay and the bullring (part of the touristic center from early years of the 20th century). And we will finish this tour providing travel tips for those heading to Colonia!